Lindsay Shytle, a service member of AmeriCorps NCCC (National Civilian Community Corps), works in the sweltering Alabama heat to rebuild a home destroyed by a tornado that struck Hackleburg on April 27, 2011. Hackleburg, Alabama, August 3, 2011, 11:05 a.m., Canon 5D Mark II, EF 24-105 mm f4.0L IS USM, f/9.0, 1/320 sec., ISO 400. Photo by Christopher Mardorf / FEMA. Team Lead Sam Ahrend directs service members of AmeriCorps NCCC (National Civilian Community Corps) working in the sweltering Alabama heat to rebuild a home destroyed by a tornado that struck Hackleburg on April 27, 2011. Hackleburg, Alabama, August 3, 2011, 12:42 p.m., Canon 5D Mark II, EF 24-105 mm f4.0L IS USM, f/11.0, 1/250 sec., ISO 400. Photo by Christopher Mardorf / FEMA. Christian Krein-Schroeder, a service member of AmeriCorps NCCC (National Civilian Community Corps), works in the sweltering Alabama heat to rebuild a home destroyed by a tornado that struck Hackleburg on April 27, 2011. Hackleburg, Alabama, August 3, 2011, 12:29 p.m., Canon 5D Mark II, EF 24-105 mm f4.0L IS USM, f/9.0, 1/400 sec., ISO 400. Photo by Christopher Mardorf / FEMA. Harley Paulsen, a service member of AmeriCorps NCCC (National Civilian Community Corps), works in the sweltering Alabama heat to rebuild a home destroyed by a tornado that struck Hackleburg on April 27, 2011. Hackleburg, Alabama, August 3, 2011, 12:47 p.m., Canon 5D Mark II, EF 24-105 mm f4.0L IS USM, f/8.0, 1/500 sec., ISO 400. Photo by Christopher Mardorf / FEMA. Lindsay Shytle, a service member of AmeriCorps NCCC (National Civilian Community Corps), works in the sweltering Alabama heat to rebuild a home destroyed by a tornado that struck Hackleburg on April 27, 2011. Hackleburg, Alabama, August 3, 2011, 11:06 a.m., Canon 5D Mark II, EF 24-105 mm f4.0L IS USM, f/10.0, 1/250 sec., ISO 400. Photo by Christopher Mardorf / FEMA. Lindsay Shytle, a service member of AmeriCorps NCCC (National Civilian Community Corps), works in the sweltering Alabama heat to rebuild a home destroyed by a tornado that struck Hackleburg on April 27, 2011. Hackleburg, Alabama, August 3, 2011, 1:00 p.m., Canon 5D Mark II, EF 24-105 mm f4.0L IS USM, f/9.0, 1/320 sec., ISO 400. Photo by Christopher Mardorf / FEMA. Service members of AmeriCorps NCCC (National Civilian Community Corps) work in the sweltering Alabama heat to rebuild a home destroyed by a tornado that struck Hackleburg on April 27, 2011. Hackleburg, Alabama, August 3, 2011, 12:52 p.m., Canon 5D Mark II, EF 24-105 mm f4.0L IS USM, f/10.0, 1/250 sec., ISO 400. Photo by Christopher Mardorf / FEMA. Christian Krein-Schroeder, a service member of AmeriCorps NCCC (National Civilian Community Corps), works in the sweltering Alabama heat to rebuild a home destroyed by a tornado that struck Hackleburg on April 27, 2011. Hackleburg, Alabama, August 3, 2011, 12:30 p.m., Canon 5D Mark II, EF 24-105 mm f4.0L IS USM, f/8.0, 1/400 sec., ISO 400. Photo by Christopher Mardorf / FEMA. Johnny Roberts, a Habitat for Humanity advisor to service members of AmeriCorps NCCC (National Civilian Community Corps), works in the sweltering Alabama heat to rebuild a home destroyed by a tornado that struck Hackleburg on April 27, 2011. Hackleburg, Alabama, August 3, 2011, 10:09 a.m., Canon 5D Mark II, EF 24-105 mm f4.0L IS USM, f/8.0, 1/320 sec., ISO 400. Photo by Christopher Mardorf / FEMA. 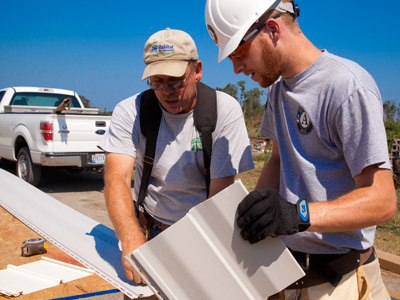 Jake Hake, a Habitat for Humanity advisor, and Trevor Manning, a service member of AmeriCorps NCCC (National Civilian Community Corps), work in the sweltering Alabama heat to rebuild a home destroyed by a tornado that struck Hackleburg on April 27, 2011. Hackleburg, Alabama, August 3, 2011, 10:29 a.m., Canon 5D Mark II, EF 24-105 mm f4.0L IS USM, f/14.0, 1/400 sec., ISO 400. Photo by Christopher Mardorf / FEMA. Tina Martini, a service member of AmeriCorps NCCC (National Civilian Community Corps), works in the sweltering Alabama heat to rebuild a home destroyed by a tornado that struck Hackleburg on April 27, 2011. Hackleburg, Alabama, August 3, 2011, 10:19 a.m., Canon 5D Mark II, EF 24-105 mm f4.0L IS USM, f/8.0, 1/400 sec., ISO 400. Photo by Christopher Mardorf / FEMA. A service member of AmeriCorps NCCC (National Civilian Community Corps) works in the sweltering Alabama heat to rebuild a home destroyed by a tornado that struck Hackleburg on April 27, 2011. Hackleburg, Alabama, August 3, 2011, 12:45 p.m., Canon 5D Mark II, EF 24-105 mm f4.0L IS USM, f/8.0, 1/400 sec., ISO 400. Photo by Christopher Mardorf / FEMA. Harley Paulsen, a service member of AmeriCorps NCCC (National Civilian Community Corps), works in the sweltering Alabama heat to rebuild a home destroyed by a tornado that struck Hackleburg on April 27, 2011. Hackleburg, Alabama, August 3, 2011, 12:46 p.m., Canon 5D Mark II, EF 24-105 mm f4.0L IS USM, f/10.0, 1/500 sec., ISO 400. Photo by Christopher Mardorf / FEMA. Trevor Manning, a service member of AmeriCorps NCCC (National Civilian Community Corps), works in the sweltering Alabama heat to rebuild a home destroyed by a tornado that struck Hackleburg on April 27, 2011. Hackleburg, Alabama, August 3, 2011, 12:50 p.m., Canon 5D Mark II, EF 24-105 mm f4.0L IS USM, f/9.0, 1/400 sec., ISO 400. Photo by Christopher Mardorf / FEMA. Sam Ahrend, a service member of AmeriCorps NCCC (National Civilian Community Corps), works in the sweltering Alabama heat to rebuild a home destroyed by a tornado that struck Hackleburg on April 27, 2011. Hackleburg, Alabama, August 3, 2011, 12:51 p.m., Canon 5D Mark II, EF 24-105 mm f4.0L IS USM, f/11.0, 1/500 sec., ISO 400. Photo by Christopher Mardorf / FEMA. 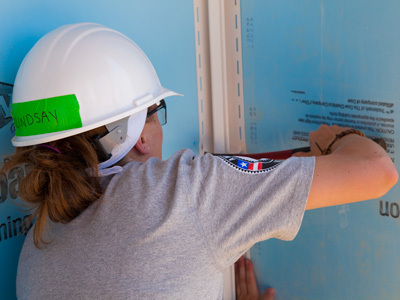 Brandi Perkins, a service member of AmeriCorps NCCC (National Civilian Community Corps), works in the sweltering Alabama heat to rebuild a home destroyed by a tornado that struck Hackleburg on April 27, 2011. Hackleburg, Alabama, August 3, 2011, 10:41 a.m., Canon 5D Mark II, EF 24-105 mm f4.0L IS USM, f/16.0, 1/640 sec., ISO 400. Photo by Christopher Mardorf / FEMA. Harley Paulsen, a service member of AmeriCorps NCCC (National Civilian Community Corps), works in the sweltering Alabama heat to rebuild a home destroyed by a tornado that struck Hackleburg on April 27, 2011. Hackleburg, Alabama, August 3, 2011, 10:16 a.m., Canon 5D Mark II, EF 24-105 mm f4.0L IS USM, f/10.0, 1/800 sec., ISO 400. Photo by Christopher Mardorf / FEMA. A service member of AmeriCorps NCCC (National Civilian Community Corps) works in the sweltering Alabama heat to rebuild a home destroyed by a tornado that struck Hackleburg on April 27, 2011. Hackleburg, Alabama, August 3, 2011, 10:13 a.m., Canon 5D Mark II, EF 24-105 mm f4.0L IS USM, f/8.0, 1/500 sec., ISO 400. Photo by Christopher Mardorf / FEMA.